This is an English translation of my Norwegian blogpost which can be found here. After the original Norwegian version of this blogpost went viral on June 26nd 2012 it was shared more than 10 000 times on Facebook and had more than 50 000 pageviews within 24 hours! Links to all media coverage of this case can be found at the bottom of the Norwegian blogpost. The Norwegian alternative-industry wish to seem like a free group of noble individuals who by supplying different sorts of traditional treatments or nutritional supplements attempt to help people. In this they always make sure they show the contrast to big-bad-pharma; which is purely profit driven and doesn’t actually wish anyone well. Quite a few people buy into this, but as we see time after time when we scratch the surface; these noble suppliers of alternative treatments or nutritional supplements without documented effects are as a rule driven by economic motives. Not that there’s anything wrong with that in itself. Everyone should be able to earn a living. The problem is that the businesses these people run often are neither honest nor particularly good-natured. We’ve recently seen Kjetil Dreyer of “Vaksineaksjonen” (anti-vaccine campaign) recommend people suffering from chronic diseases from Lyme disease to AIDS to rather drink his silver water than use conventional medicine. He uses the weakest among us as a means to money through the sale of products from his own web shop, Altshop. That replacing HIV-medication with silver water entails a much quicker death for these people doesn’t matter much as long as he can portray himself as a Health-Messiah and earn a small fortune from selling overpriced silver nanoparticles while he’s at it. Dreyer is only one among many cynical sharks in these waters. I was recently contacted by a guy who in his desperation asked my advice. That is, this happened in the end of April, but I’ve let it lie for a while to see if anything changed. The case, it seems, has now reached its conclusion, so the time is ripe for sharing this with the world. Millions of people all over the world eat chocolate every day. Unfortunately not all chocolate is healthy, but a healthy alternative does actually exist. Xoçai chocolate products don’t just taste nice; they’re also very healthy because of the high antioxidant-content. – Can help against skin disease, e.g. psoriasis. – Can stabilize blood pressure. No less than a fantastic product, it would seem, and claims of effects on specific diseases and symptoms are plentiful. Well, not everyone has agreed to the incredible nature of the chocolate, and the one who contacted me wishes, for reasons soon to be explained, to stay anonymous in this blogpost. Let’s call him «Morten» for now. A few years ago Morten wrote a blogpost where he critically appraised the claims made concerning the Xoçai chocolate. Not only that, he was also highly critical of how the chocolate was sold; Multi Level Marketing (MLM). Around the same time another critical post on Xoçai was published, written by a guest blogger by the name of Espen Løkkevig. Quite the debate arose in the comments-section of these two posts, and both the authors answered to the best of their ability, with documentation for the claims and fitting language. As time went by, the discussion cooled, and the two blogposts climbed the hitlist on Google. After a while they were among the top hits when doing a Google-search on Xoçai. This wasn’t taken well by all. From the signals we have received it will be a seven digit lawsuit, and that’s not in Norwegian «kroner». This because the company now wishes to make an example once and for all, and such create precedence for other countries in Scandinavia and Europe. We are of course aware that the company [anonymous company] doesn’t have any responsibility for your blog – but as it can be documented that a lot of your activity on the blogpage has been during work hours, we assume it is with your employer’s [anonymous company] knowledge and blessing in accordance with your terms of employment. In the light of your cynical activities it must be admitted that this isn’t the best advertisement for the company [anonymous company] and your co-workers, neither now nor when the process starts. This is [blank] the man behind the blog www. [blank].no who knowingly has put forth untrue, undocumented and defamatory claims intending to damage the brand name and product Xoçai, the company MXI Corp. in the USA and the company’s representatives – to earn money. All his untrue statements and defamatory claims have now been sent to the company’s lawyers in the USA to initiate a lawsuit. I have again removed Morten’s real name, his domain/webpage, the name of his employer and the picture of him, but in the original website (of which I have saved a copy) all this was visible. It should also be mentioned that Sjokoservice Norge were childish enough to edit his surname slightly so it spelled a negative word which made him appear even worse. Not particularly professional. The more visits (hits, clicks) he has on his website – and he can show potential advertisers – the easier selling advertisement space becomes. To get as many hits as possible on his website, one of his unethical methods is to present incorrect and untrue claims concerning a product, company and the company’s representatives. By doing this he knows several Norwegian representatives of the company will react by writing counterarguments on his blog (website) and the more who are annoyed by his untrue claims, the more hits he gets to show potential advertisers. In other words; cynical exploitation and manipulation to earn money. [Morten] might have calculated on the probability of the company MXI corp. in the USA suing him as relatively low in a country like Norway. 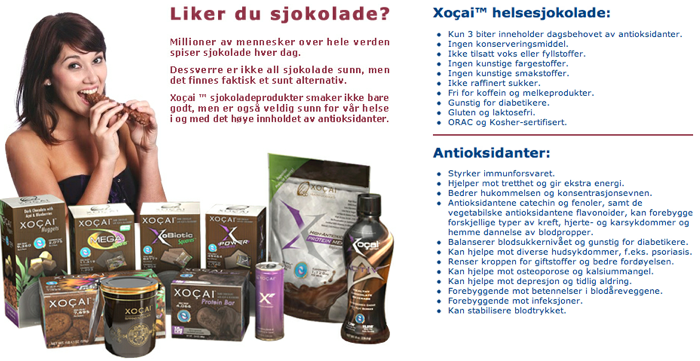 The good news is therefore that everything that has been written of defamatory and undocumented claims has been sent to MXI corp.’s lawyers in the USA, where they are currently preparing a lawsuit on the grounds of [Morten]’s untrue claims that have injured the brand name and product Xoçai, the company MXI corp. in the USA and the representatives of the company. From the signals we have received the lawsuit will be for a seven digits sum, and not in kroner. This because the company now wishes to make an example once and for all, and as such create precedence for other countries in Scandinavia and the rest of Europe. Must admit we’re looking forwards to the continuation of this. Further they write that he blogs during company work hours and thereafter publish Morten’s contact information with home address, telephone number, workplace and e-mail addresses. As most of [Morten]’s activity on the blog [anonymous] is between 08:00 and 16:00, we naturally assume this is with the knowledge and consent of his employer according to his employ. We thereby assume it natural that [Morten] will answer e-mail and telephone calls from whomever might wish to contact him during the same hours – between 08:00 – 16:00. Shocking. They actually use words like cynical, unethical and manipulation about a guy who hasn’t done anything other than checking whether or not the incredible claims concerning the Xoçai chocolate are correct, criticized this while referring to sound sources, and criticized how the chocolate is being sold through network marketing – a method that generally is founded on false promises and trickery. Both blogposts attacked by Sjokoservice Norge are substantive and well founded, but unable to meet this science based criticism they in a familiar alternative-style choose ad hominem attacks. As the association for Norwegian Xoçai members we have over the last year received hundreds of complaints concerning your blog [anonymous].no. Excessive, you might think? Well, you’ll be further shocked to hear they attached detailed directions to his house, a picture showing his genealogy (pictures and names of Morten’s parents, siblings and wife; all with occupation, year of birth and residence supplied), a map from Google Maps showing his residence, and a picture of contact information from Enhetsregisteret and Norid. It’s hard to call this anything but a malicious threat. Sjokoservice Norge imply that both Morten and his family will be approached in person, and make sure anyone who wishes to do this can. 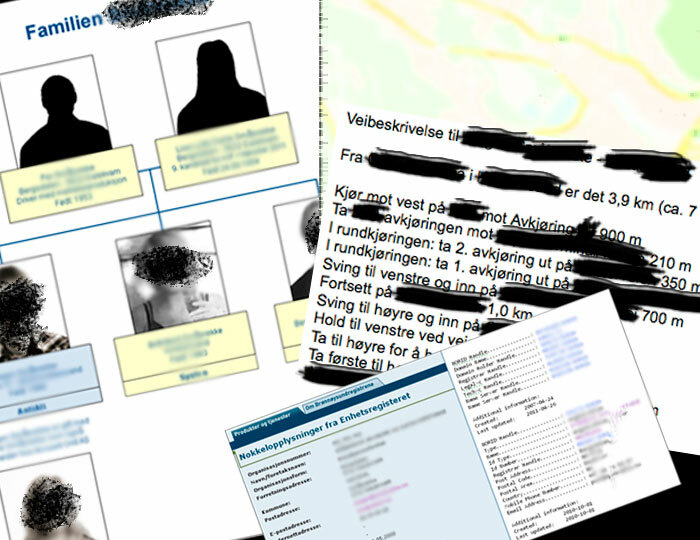 Notice that the people at Sjokoservice Norge try to waive any responsibility by pretending they have no control over the events and whoever is sending out information on Morten, his family and his employer is someone else entirely. Sjokoservice are only acting out of «kindness» by informing Morten of these events taking place, in addition to they themselves posting much of the same information on their own website to please their members. Frightening and disgusting. 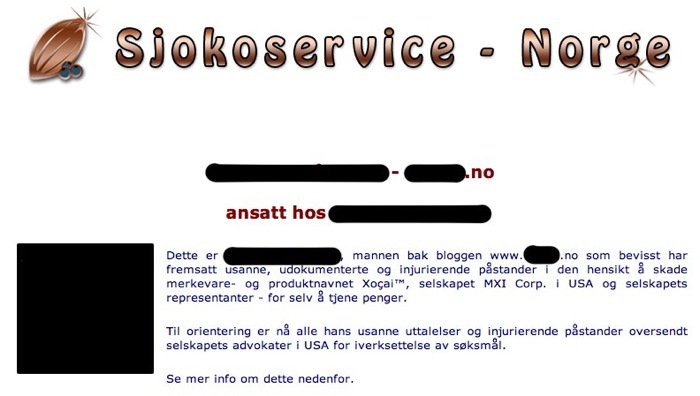 Sjokoservice Norge is an association where all members of the MXI Corp. (Xoçai) network in Norway can apply for membership. The goal of the organization is not to earn money, but to contribute with service and support exceeding what MXI Corp. in the USA can offer Norwegian members. The organization will also contribute with education, meetings and seminars where the association will hire professionals and lecturers of the highest quality. The company contact is a man named Roger Meyer according to proff.no. Is he the one behind these threatening e-mails? We don’t know, but before Morten published the posts in 2010 he e-mailed 15 distributors of Xoçai and asked them to contact him if they found any mistakes in his information that should be corrected before publication. He only received one constructive answer which resulted in a short e-mail dialogue, this from Roger Meyer who at the time represented the company sjokolade4you.no. Other answer were not of a fruitful nature. The Chairman of Sjokoservice Norge is called Terje Ragnar Babsvik, and even though Morten has had no direct contact with him he noticed one of the distributors he e-mailed for fact-checking added Babsvik as a cc-recipient of the e-mail dialogue in 2010. The third involved party is Jan-Vidar Pedersen who is listed as legal contact and accountable person for sjokoladeservice.no from which the first e-mail was sent. Meyer himself is listed as legal contact and accountable person for the domain sjokoservice.no. You can see the entire board of Sjokoservice Norge at proff.no. Are any of these behind the threatening e-mails? We simply can’t know, but they all represent and sit on the board of the association, and when threatening and defamatory attacks on a person are published on their website, and threatening e-mails are being sent in the name of the association, one must be able to hold these key people accountable. Morten has explained that this blogging Sjokoservice claim happened during his work hours was done while he was at home on paternity leave. He had two days off every week that he used, among other things, to blog. Morten has three young children, the youngest only a few months old, which is one of the reasons threats about people showing up on his doorstep was an unpleasant experience. After receiving the first e-mails he told his superiors of the situation. They couldn’t help smile, but there was a problem. The owner of company Morten works for is a larger American company. This company did not want negative remarks concerning one of their employees published on the web, and as such Morten experienced a dilemma. When he contacted me to ask my advice, my first thought was that his reminded me of another case from 2011, when the Polish-American quack Stanislaw Burzynski threatened bloggers who wrote critically about his undocumented cancer treatment. One of those threatened was the young skeptic blogger Rhys Morgan who received help from British supporters who knew the legal system well. What he did was to answer politely and request that the one threatening him at Burzynski’s behest specified exactly what he thought was incorrect and to document this, in which case Morgan would remove or correct the information. Sending general threats without being able to specify what actually is wrong won’t do, neither for Burzynski nor Sjokoservice Norge. Thank you for the feedback. If you can specify and document which claims you consider incorrect on my website I will of course correct these. I want the information I publish to be as correct as possible so people who look for information on the subjects I write about will get as correct as possible picture of the situation. In accordance with your responsibilities as the editor you are responsible for everything made public on your blog. This in accordance with the criminal code’s §431, §436 and §10. As the editor you are at all times responsible for making sure the content of your blog are in accordance with the editorial guidelines for this, including controlling on your own or through others that these guidelines are followed. E.g. that no discriminating, defamatory, untrue or libelous claims or statements about persons, companies, co-workers in a company, products or brand name may be published. As the editor you are also under special criminal liability where you as the editor are liable for all published content on the blog, even if you yourself haven’t written or approved every comment (Criminal Code §431). As the editor you are also tort responsible, and people who have been violated can pursue the matter and bring legal proceedings against you. We have received many suggestions; from warning against your blog and person in all social media and blogs, to contacting newspapers. We can imagine the title: “Bloggers puts forth false claims in cynical ploy to make money on advertisements”. [Morten] and the blog [anonymous].no will be used as examples in the article. Some of our members work within the media and have already found interest for this angle. Some also wish to gather a group of people to visit you at [place of residence] to discuss your blog face to face. We have of course discouraged such action, but it’s out of our hands. Take note of the twisted perception of reality these people have. Only to characterize a substantive blogpost supported by references with criticism of a product as “defamatory” is ridiculous. Even worse, though, are the thinly veiled threats against Morten. They wish to stop his “attack on the product Xoçai […] once and for all”, and imply that they will show up at his house to stop his criticism of Xoçai. In some way or another. This is excessive in the extreme. It is also disgusting to see how Sjokoladeservice Norge time and again try to sit on their hands by claiming that their members are threatening, while they themselves are attempting to cool hot tempers. (What do the members think of the association’s leadership blaming them, I wonder?). They still claim it’s out of their hands, despite their own addition of fuel to the fire by publishing contact information and attacks on Morten’s person on his own website and in e-mails to their members. It’s also quite absurd that Sjokoservice Norge think the media would present Morten as the «bad guy» and Sjokoservice Norge as the innocent victim. Everyone who keeps their head in the real world will understand that any media attention, which is something I hope for after this blogpost, will be focused on the attacks on and public humiliation of Morten from Sjokoservice Norge, based on their inability to take criticism of a product they have a commercial interest in keeping free of criticism. Sjokoservice Norge have everything to lose after how they chose to handle this case. So; if one dares criticize anyone within MLM one simply has to accept harassment, attacks on one’s person and threats. This is the twisted reality these players in the health foods market operate from. There are no noble intentions, only a hard motive of profit based on illegal marketing with claims so fragile that any criticism that might disrupt the flow of cash must be immediately attacked. The truth is secondary – revenue is king. Well, the terms of the deal were met by both parties, and the two blogposts are now gone. If you do a Google-search for Xoçai now, you mainly get positive reviews of the chocolate. Has anyone here heard of the Streisand-effect? It’s a phenomenon that occurs when someone attempts to censor or hide information on the internet and results in further proliferation of the information. One of my blogposts was a result of the Streisand effect when a critical blogpost on homeopathy (The Gentle Art of Homeopathic Killing) written by a British (?) blogger, Andy Lewis behind the blog The Quackometer, was attempted removed. The Society of Homeopaths contacted his ISP and threatened with legal action. The ISP chickened out and made Lewis remove the post to avoid any difficulties. Many bloggers around the globe chose to republish his critical blogpost to support him. The post, rather than disappearing, became a hundred times more visible. Likewise: when the authors of the two blogposts told me what had happened and the reason for their removal, I got angry. Very angry. I asked the authors for permission to republish the posts. They permitted this, since both posts were to be found in Google Cache and I could easily copy them from there. Morten did not wish to be involved, however, as he considered the case closed on his part. Løkkevig had no objections to my publishing the post in my blog under his full name. Considerable effort lies behind also his post, and it’s a travesty that the article disappeared as a result of events outside of his control. These are two interesting articles you absolutely should spend a few minutes on. Here you’ll learn why this “healthy chocolate” probably isn’t that healthy after all, why claims of antioxidants’ health effects lack scientific documentation, and why network marketing/MLM is the slightly less cruel cousin of pyramid scams. I also wish to encourage anyone with a blog of their own to copy the contents of both blogposts and republish them. The goal is that as many as possible will republish the criticism of Xoçai so they again end up on the top of Google-hits. If this is turns out difficult I ask that you write a few lines and link to this and both the Xoçai posts so they’ll climb the Google rankings. Do we have anything to fear? I doubt it. Morten had to bend to the threats because he was in a vulnerable position because of his employment and in fear of more unpleasant experiences for his family. The rest of us, independent of American firms, have nothing to fear. The information is substantive, legal and important. The threats from Sjokoservice Norge were empty, as they would never be able to mount a case here. It was, however, a useful tool to pressure Morten’s employer. 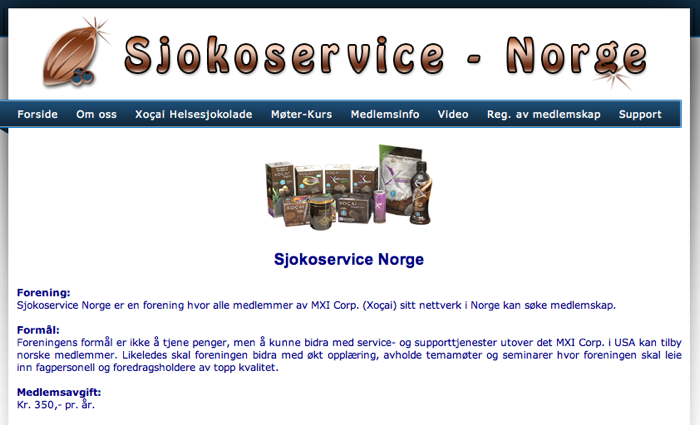 Sjokoservice Norge’s unethical behavior should be made visible, the criticism towards Xoçai and network marketing will be spread by the wind, and the people responsible for the threats towards Morten will feel the full weight of the Streisand effect on the reputation of their association – and maybe their bottom line. We cannot under any circumstances allow that commercial interests threaten bloggers to remove substantive criticism. We must all stand and support Morten and the freedom of speech, and show that this is unacceptable.